Gynecological diseases represent a collective term given to different medical conditions specific to the female reproductive system. Thus, gynecological diseases include conditions affecting the uterus, ovaries and their appendages. Gynecological devices are medical devices that are utilized exclusively in gynecological procedures such as surgeries, diagnosis, and routine examination. The global gynecology devices market was valued at US$ 16,840.95 Mn in 2017. It is expected to expand at a CAGR of 4.1% from 2018 to 2026. The global gynecology devices market has been segmented based on product type and region. Furthermore, in terms of product type, the market has been divided into surgical devices, hand instruments, diagnostic imaging systems, and gynecological chairs. The surgical devices segment is likely to account for a leading share of the global market during the forecast period owing to increase in prevalence of minimally invasive gynecological procedures and increased efficacy of endometrial ablation, which has fuelled the demand for endometrial ablation surgical devices. In terms of region, the global gynecology devices market has been segmented into five major regions: North America, Europe, Asia Pacific, Latin America, and Middle East & Africa. North America accounted for a major share of the global market in 2017, primarily due to highly evolved reimbursement policies along with the initial introduction of devices only in the U.S. market. 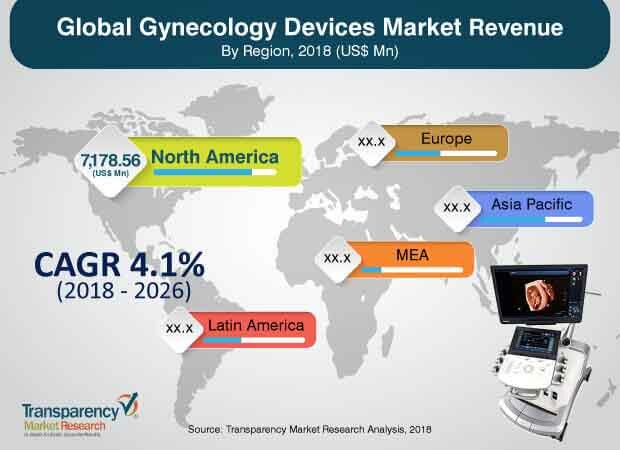 However, the shift of focus of gynecological device manufacturers toward the markets in Europe and Asia Pacific, due to the delay in approval of medical devices by the US-FDA, is expected to lead to loss of market share held by North America by the end of 2026. Furthermore, the market in Asia Pacific is anticipated to be highly attractive in the near future due to the existence of a large patient pool, increasing awareness and preference for minimally invasive surgeries, coupled with increase in government funding and developmental initiatives in healthcare facilities in the region. Moreover, low cost of manufacturing in China and India has resulted in the rise in the production facilities, attracting key players to the region from across the world. Key players operating in the global gynecology devices market include Boston Scientific Corporation, CooperSurgical, Inc., Ethicon (Johnson & Johnson), Hologic, Inc., Medtronic, Olympus Corporation, Richard Wolf Gmbh, Stryker Corporation, and Karl Storz Gmbh & Co. KG. These companies have a diverse product offerings and extensive distribution systems across the world. Moreover, entry of small players, especially in the emerging markets of Asia, is being witnessed. However, stringent regulatory framework and high-quality standards set by market leaders are anticipated to restrain the penetration of new entrants in the market. This report analyzes the current and future scenario of the global gynecology devices market. Technological advancements, high prevalence of gynecology diseases, and increase in patient preference for minimally invasive surgeries are major drivers of the global market.